This is our final leg of the Hayduke and I’m happy that it’s ending on a relaxed note. 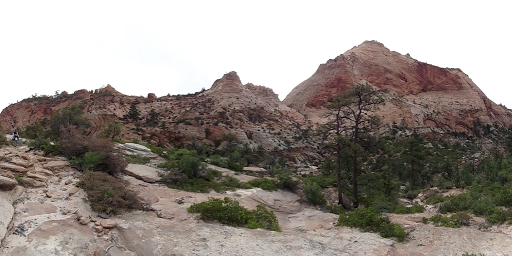 Technically, we could have done the miles to finish tomorrow at the southeast edge of Zion National Park. We are doing a bonus alternate of two days to do an additional 40mi traverse of Zion from the southeast to the northwest. With where water and campable areas are, the first two days out will be nice and relaxed. 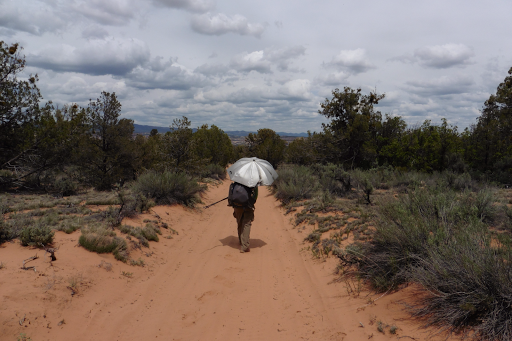 We only needed to do 15mi today to end at water and then it’s another ~15mi to the campable area in Zion. Katherine started 4mi back from us to spread out. We may overlap at water sources or camp areas and we all plan to finish the same day. It was a chilly one this morning in the mid 40s and I wore my down jacket and beanie for a bit. 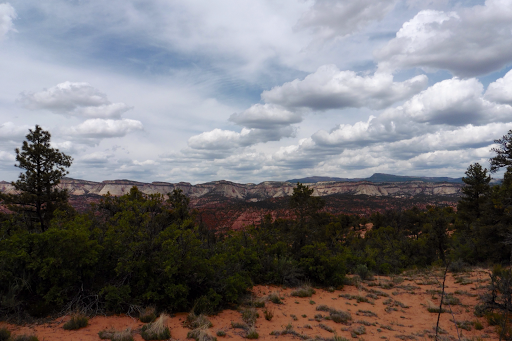 We started out with an unexpected scenic climb through an area that reminded us of Coyote Buttes called Canaan Mtn on the GPS. 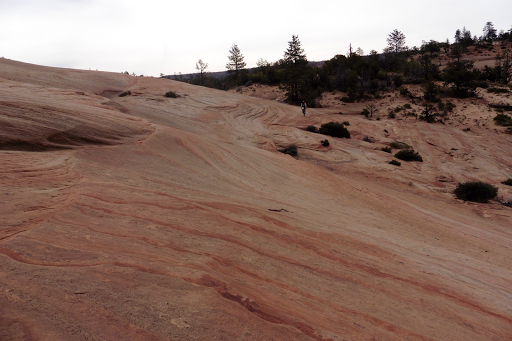 It was really enjoyable and had nice slick rock, which I feel like we haven’t hiked on in ages. The rest of the day was mostly spent on deep sandy jeep roads. Really, nothing eventful. It was upper 60s and overcast much of the first half of the day, which is a miracle and made the sand slogging somewhat relaxing. I was on autopilot most of the day and listened to music on and off. Just a nice chill day. We had lunch early at 11:30am, knowing we had fewer miles today. When we got to lunch, we realized we had already done 10mi and only had 5mi left to go for the day! 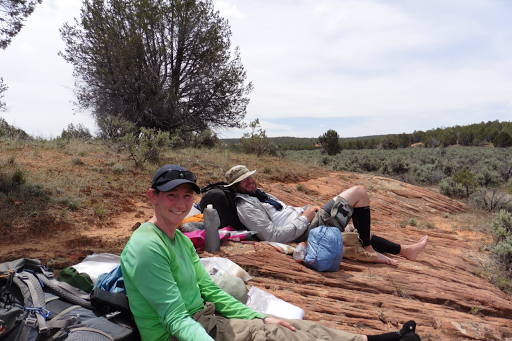 We took a longer lunch break and chilled on one of the few rock spots we had in the afternoon. The sun did come out more as the day got later and clouds moved on. My umbrella came in handy once again. I’ve used it tons in both rain and sun these last couple weeks and really do love it! Towards the end of the day, before we headed down to the E Fork Virgin River, we could see Zion and where we are headed tomorrow. It was a great first impression and I’m really excited to get to Zion. We hit the outskirts tomorrow, yay! 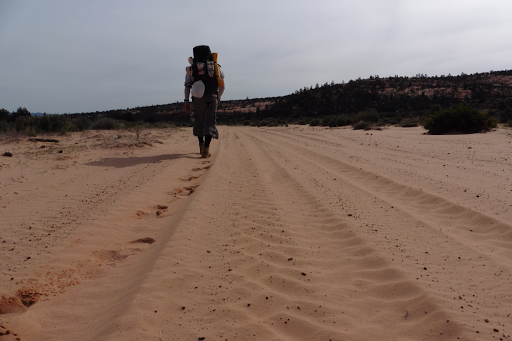 The final bit today was a .1mi descent to the E Fork Virgin River. The view from the top was cool. The curve you see in the left center is what we will be hiking through. That 5mi stretch is quite narrow and along the river, so we will be walking in it tomorrow and good camping space is sparse. We tried to camp next to it tonight and it was not good for camping. Gnats were all over and there were droppings everywhere from what seemed like goats. In addition, it seemed to be one big any hill with ants everywhere we went. Even across the trail. 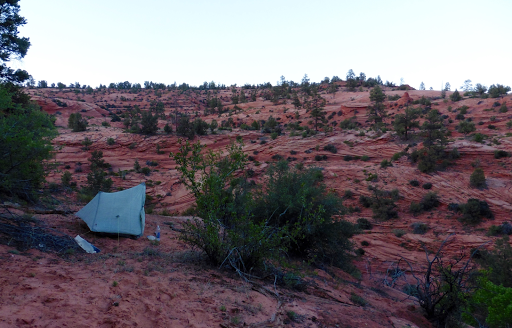 We grabbed water and hiked back up to setup camp on the rock ledges to avoid the ants at least. It wasn’t even 4pm by the time we got back up. We totally chilled. I got to finish my blog post from yesterday and made dinner early. I thought I was hungry, but having not hiked much, I guess I wasn’t and Gavin got half my Mac & Cheese tonight. Good thing so I wouldn’t have to carry it out. I packed way too much food for this leg. I was worried about hiker hunger and got the opposite. When I do less activity in a day (like today) my body immediately wants less food. Looks like I’ll have plenty leftover from this leg.